I’m out of town for a family wedding the next 4 days. 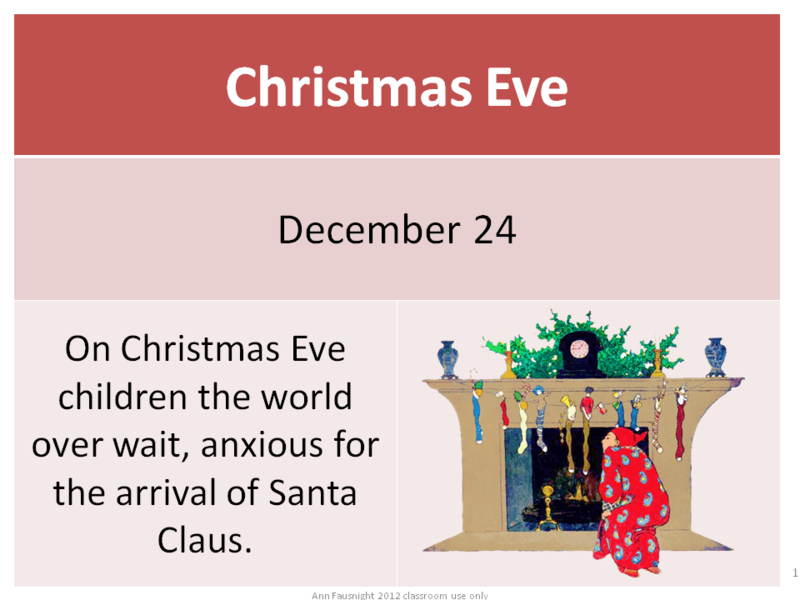 Holiday Word of the Day cards will return on Tuesday. Continuing with my holiday word of the day cards, I like to have a review card that features 4 of the cards at once. This card is in black and white. Teachers can use it instead of the 4 color cards, which would save paper and ink. It could be copied for students to have their own resource to match the cards presented in class. My store and TPT are on sale today, too! Many great deals available. The sale was fun yesterday. I kept sneaking over to the computer to see if I sold anything else. I tried my best not to read any of the brag posts on the forum. They make me less happy about my own accomplishments. It was my best day on TPT! I am taking my Christmas contractions and Christmas ABC order to school today for planning. It’ll be interesting to see how many people want them for their class. 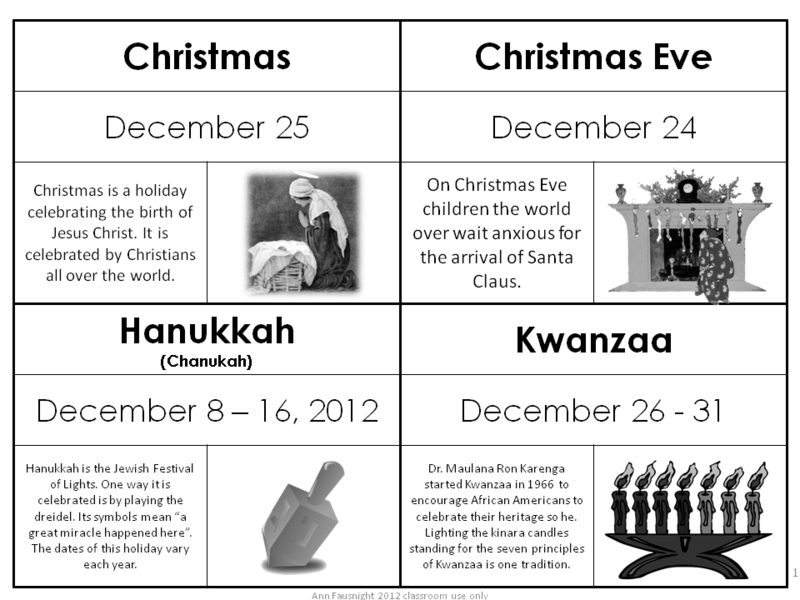 We will be planning our cultures and celebrations unit today. I am thinking of making a writing map project for the kids to keep notes on. I am excited to try this. Here’s the next December holiday card. 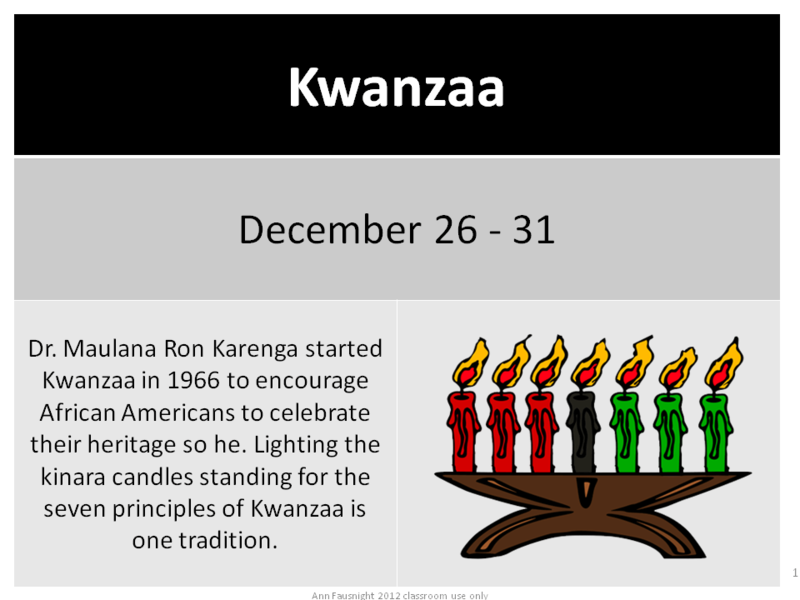 Laura Candler has a Holiday Learning Link Up that you will want to check out!! Our third graders have embarked on the journey of expository writing. They are coming to grips with the idea of a thesis statement and supporting paragraphs. It is a daunting task. Their first efforts came just before Thanksgiving with a planet project. This was helped by a free product from fellow TPT seller Wendy Smith and her Out of this World Informational Writing Mini Unit. Now we are going to turn to our social studies TEKS (Texas Essential Knowledge and Skills – objectives) and conquer cultures and celebrations. 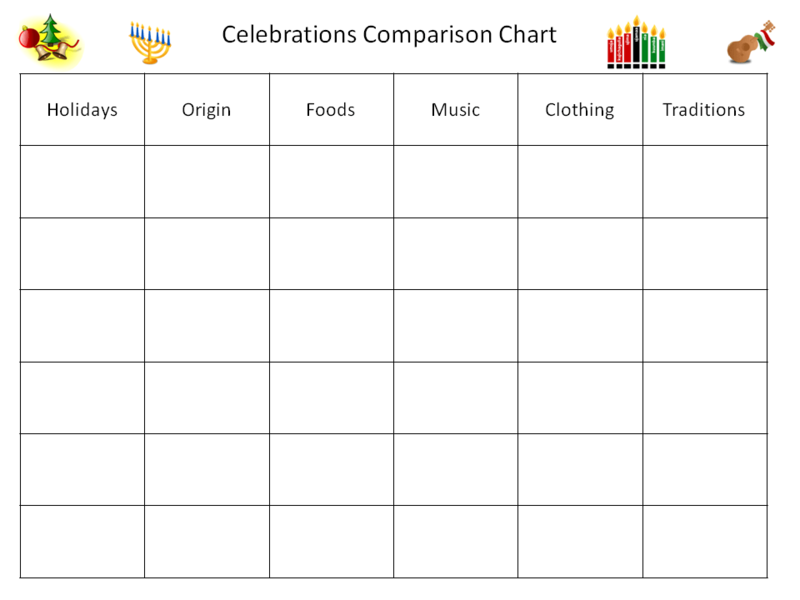 (B) compare ethnic and/or cultural celebrations in the local community with other communities. We will read Horrible Harry and the Holidaze by Suzy Kline, which briefly introduces Christmas, Kwanzaa, Hanukkah, Korean New Year, and Three Kings Day. The story’s fiction elements help provide the extra interest needed during this distracting time of year. We will discuss the similarities among celebrations and the differences (more than those presented by the story). We will consider the reasons for celebrations and how culture influences these celebrations. We will foster a sense of acceptance and respect for all of the various celebrations. We will complete a Comparison Chart to organize our thinking. Then use the chart to form a thesis statement to begin our holidays writing project. In preparation for this project I have been making (and posting) December Holiday Word of the Day cards. Here are the ones I have posted to date. Check back throughout November and into December for the others. We have done this project for several years. This will be our first year writing a thesis statement. I think the students will be able to respond well. Here’s to lots of holiday learning! Thanks, President Coolidge, I find it remarkable that words someone spoke in another era can make me feel better, more capable, and stronger. No, I know words of support are out there, my goodness, I can’t forget the Bible. But words from people that are barely an afterthought in my brain, that surprises me. It delights me that this age can bring me wisdom from everywhere and every time, if I just ask. We need to teach our students to find the treasures available. I may not be having the success I want yet, but giving up, not trying everything, or worrying about bothering others will definitely not bring about the results I want either. I will be persistent. My Teachers Notebook store is currently on sale at 25% off with another 10% off given by the website. Teachers Pay Teachers begins its big Cyber Monday Bonus Tuesday sale tomorrow, but my store is on sale today! See you at my store! Happy Shopping!